A few thoughts on the Arsenal 7 (Seven) Blackburn 1 match | "It's all about the Arsenal"
It’s all about Prydun Youth FC…………………. Wake up! Today the plan was, get ready and go watch Son Luke play football for his local team. The match was going to conflict with early Arsenal kick off so I had already made plans to sell my season tickets. 8.10am the old BlackBerry start buzzing. Text coming in………….. Open up text and It’s Steve the manager of Prydun Youth FC, game has been called off, frozen pitch. No Prydun. No Arsenal today. Nah! Time for a phone call or two. First call and I hit the jackpot. The guy selling my tickets had sold them but not passed them on as yet, he was meeting the buyers at Emirates. “Change of plan mate I can go now” I say… “No problem”, he says… I’m thinking on the go here. “Mate any chance you have any lower tier seats available?” “yes ” he replies. “Well how about you keep my two upper tier and I take two lower off you, you can keep the difference?”. “No problem” He says. THAT WAS CLOSE!!! Luke has wanted to watch a match in Lower tier since I took him to the away match v Orient last season in FA Cup. He loved the closeness of it all. Time is getting on Luke and I decide, Full English would be in order for matchday. No time to cook, so it’s a Tesco full on and mug of tea. Breakfast finished and feeling full for the day ahead. Time to leave Tesco’s; jump in the Jam Jar, where her indoors is dropping us off at Epping Tube. We’re at Epping courtosy of the Victoria Line being closed this weekend for upgrading, I’m old enough to remember the Victoria line opening in 1968. 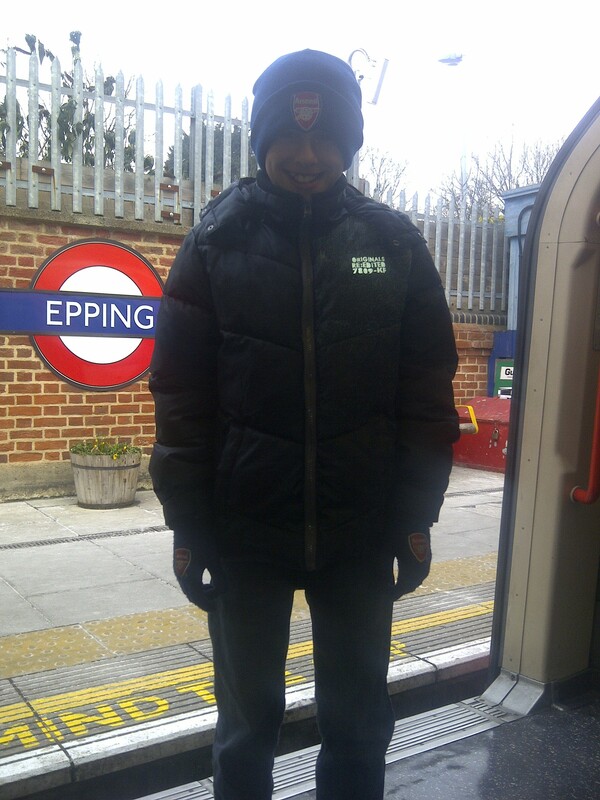 Epping – Stratford – Highbury & Islington. Then a walk down Holloway Road. I like to walk about. I like to look about. Walk round some of the back streets off Holloway Road, to meet contact at Drayton Park. Tickets sorted and off we go and into Turnstile “N” Block “25” and take our seat in Row “3” right behind the goal. Not a black bin bag to be seen. My Rating for Arsenal: Szczesny (6), Koscielny (7) (Sagna 68 (6)), Mertesacker (7), Vermaelen (7), Coquelin (8), Song (7) (Benayoun 72 (5)), Rosicky (8), Arteta (8), Walcott (9), Van Persie (10), Oxlade-Chamberlain (9) (Henry 68 (6)). Subs not used: Fabianski, Park, Ramsey, Arshavin. 1.00pm game kicks off.. 2mins in and OXO – Walcott – Robin Van (here scores when he wants) Persie!!! sees what is coming and pulls off his man and a simple tap in 1-0 to the Arsenal.. Oxo drags one wide… Oxo is put in again by Song and again drags his shot acoss the goal with no one gambling (expected to see Ray Winstones massive head appear above me). Then a lovely bit of skill from TR7 who stops the ball in the air with his heel and shaped himself to bang one in and hit a defender. TR7 then hits another that swerves inwards and just goes past the post. RVP great feet, soft shoe shuffle and bamboozles the Blackburn defender and does a lovely chip and it just sails past the post. Arsenal now playing within themselves, in fact it’s does look a little like 2012 start to be honest and this could spell danger. 31 Mins and Kos gives away a free kick, first transgression and no messing b y the ref, straight into the book, well he’s a Gooner. Modeste was booked after three fouls and a warning. and Junior Toilet got away with one. 25 yards out and they have that bloke Pederson Would you Adam & Eve it, just like Larsson, he steps up and curls what Paul Merson would call a “Worldy”, beating S13 all ends up. I’m thinking how comes our opponents have such a good shot to goal ratio against us. The new signing TR7 (well he is like a new signing) slides into win the ball and takes out Lowe with a low tackle he should have been booked). Match stops, stretcher called for. Lowe gets up and walks off and is replaced by “your old lady is a an Orr”. 38 mins and midfield anchor man come pass through the eye of needle Billabong Song, slides in Theo who crosses back from the byline and there is Robin Van (here scores when he wants) Persie to make it 2-1 to the Arse. Back in front “We by faaaaaaar the greatest team the word has ever seen ” rises from the Emirates. BFG head close and a chorus of “Big f***ing German, He’s just a big f***ing German” comes alive. TR7 is fouled by Olsson, Andre Marriner plays on. Van Persie plays a reverse eye of the needle pass through Blackburn’s defence, Oxo runs onto it rounding Robinson and sliding it into the net for his first league goal to make it 3-1 Arse!!! Two in two minutes, happy days!!! 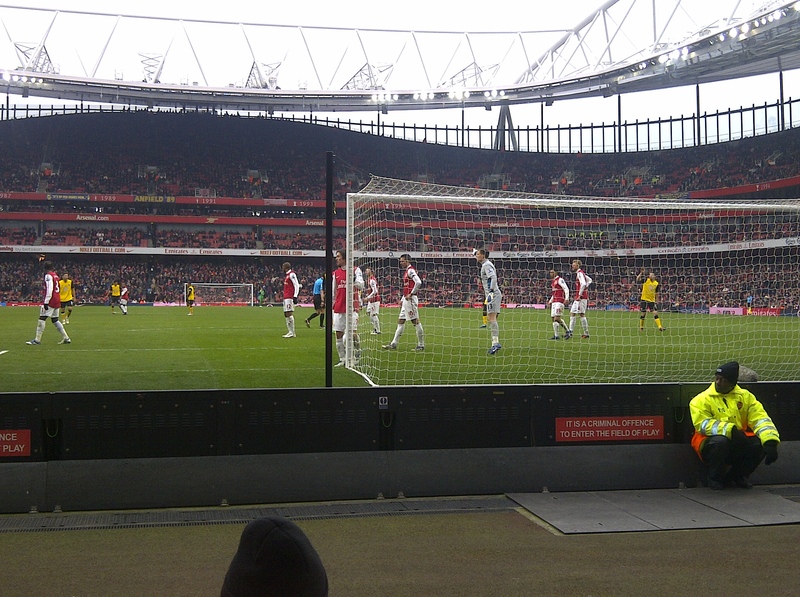 That goal being the 56th goal Robinson has let in v Arsenal, came the stat behind me. Next up the hippy Givet decides he wants a piece of RVP to sell on eBay and goes in like Bobby nutter (a pwoper made in Stoke tackle). Refs have been warned this week to come down hard on this type of tackle and the Ref goes to his back pocket to get a pair of scissors to cut Givets hair, but only brings out a red to the relief of Givet, who walks off after checking to see if RVP is alright or was it to get his memento to list on eBay later. HT 3-1. Luke wants a Hot Dog, I wanna point Percy at the porcelain, Percy wins… The queue for the khazi was stupid, took almost all of HT. Back to seats, leave Luke with nice couple behind and run back up apples & pairs to get Luke a foot long Hotdog and rush back down in time to see Arteta hit one from the edge of glory and into the onion bag via a deflection off your old Lady for 4-1 to the Arse!!! Emirates is rocking and it needed this performance. Time now to get the flask out, two teas for Luke and me. Arsenal are in total control now. The ball is played wide to Theo who is now doing what Walcott can do, running at teams and causing the problems. Into the area he goes, past one, past two, looks to shoot, but sees Oxo and slides the ball into him, Oxo has a nice touch taking him past the defender onto his right and tucks the ball away nicely into the bottom corner to Robinson’s right. Oxo get the ball on the left, controls, goes past one Blackburn defender, runs onto meet the next, gives him the eye and drops the shoulder, the old one, two and the defender is left for dead. On goes Oxo to the edge of the area, comes back on himself, look up and crosses superbly to Arteta who shapes and blazes over the bar, had he scored that would have been a “Worldy” reminiscent of Songs mazy run and cross v Dortmund for RVP. 6-1 Van Persie bagged his hat-trick with another class finish. The young lad Coquelin takes the ball past Junior Toilet on the right and slide the ball into Robin Van (he scores when he wants)Persie whose movement in the box was superb made space for himself and just the speed of the ball do the work as RVP just aimed the ball into the net past the hapless Robinson, who had now conceded 59 goals v Arsenal, the third time in recent memory we had slammed SIX past Blackburn. Oxo is replaced by Henry and not a boo in the stadium save a standing ovation. Koscielny is replaced by Sagna. Benayoun replaces Song. The icing on the cake was about to be delivered. TH12 robs Hanley, does a one, two with RVP shapes in true TH14 stylie and hits the ball into the net off the Scott Dann for 7-1 and no 228 for “The King” That could well be the last time we see “The King” play at home so what a way to sign off. I felt so pleased for huge amount of fans that thought it was much better to leave early to get the tube at 2.45pm in the afternoon. You can sort of Understand it was an evening match and extra time had been played, but 2.45 in the afternoon, why leave? The least you could do is stay and applaud your team off the park. Complaints about the team can be justified, but it is a two way street and on this occasion the fans should have done their but and stayed and gave the team a good round of applause as they left the pitch. This was Luke’s first big win since he has been going over the Arsenal and boy was he excited. Now it was home via Highbury & Islington – Stratford – and her indoors picking us up from Epping. Blimey the snow has now seriously settled. Another great peice, its great to live the Arsenal dream, even if it is vicariously through your musings. Work comitments prevent me from going at the moment so keep up the good work! Thanks Geoff. I thought I would try a blog that gives fans a feel of what it like on match days.